If you google "slimy yogurt" or "why is my yogurt slimy", you will find plenty of people complaining about this, yet I've been making yogurt on and off for more years than I care to remember and never had that problem until I moved to New Brunswick. Must be the way they process the milk here, or the way they feed the cows, or something. I don't eat a lot of yogurt these days, but I have to make it regularly because I need it to culture the cream that I use to make my own butter, and around here you can't buy plain yogurt. Then I get to eat the leftover yogurt. My favourite way is with a bit of maple syrup or honey, for dessert. Sometimes I drain it and make yogurt cheese, which I like every bit as much as cream cheese. So I googled "why is my yogurt slimy", and eventually found the solution: you bring the milk temperature to 185 degrees (Fahrenheit) and hold it there for a while (some say 20 minutes, some say 30 minutes), which does something to the protein structure of the milk. The result is thick, creamy, non-slimy yogurt even if you use just regular milk (3.5% butterfat) and no extra skim milk powder (to give it body). 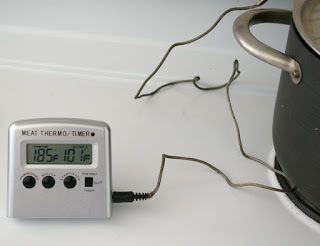 I tested every electrical appliance I had: the small coffee heater that I use to incubate the yogurt at 110 degrees, (didn't rise above 150 degrees) my crock pot, (reached 185 degrees on "high" but I had to keep playing with the lid to keep the temperature constant) and one of the burners of my stove. Eventually, it was the latter that gave consistent results with no temperature variation at all. As you can see in the picture, I used a remote thermometer for all my tests. I ran all the tests over several hours, checking every half hour or so to ensure there were no wild variations. I did all the tests with a lid on because it's more hygienic. So, if you have a problem with slimy yogurt, try heating it to 185 degrees and holding it at that temperature for half an hour or so. After that, you cool it to 110 degrees, add the culture and proceed with your usual method. Thank you! I had the slimy yogurt problem for my very first time yesterday, and I realized after reading your blog, that it was because I had tried a new recipe. This new recipe had me heat the milk to just 115 degrees F, and every other recipe I had ever done called for the 185 degrees like you said. I should have noticed the difference in the 2 recipes before I started it! At least I won't make that mistake again and waste a whole gallon of expensive organic milk, thank you again!! Glad to be of some help, Anonymous. Is the sliminess a health hazard or can I continue using it to make labneh cheese? No health hazard, it's just that some people don't like the texture. I'm one of them. Thanks for the info. My last batch was perfect, but now I realize that I kept it at 180 longer because I was busy with something. My most recent batch was really slimy. I turned off the crock pot as soon as it hit 180. 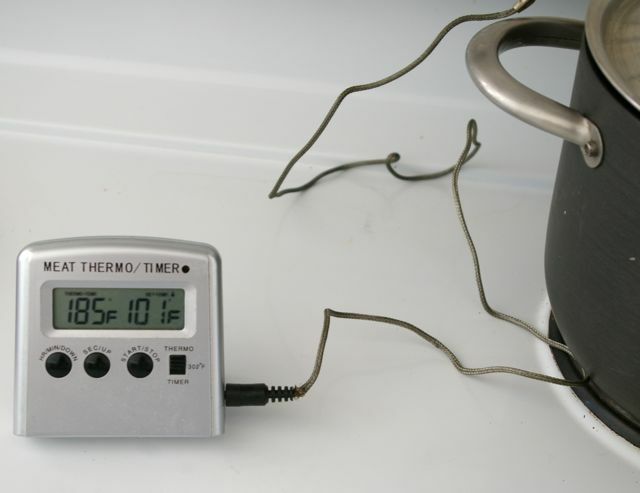 My crock pot can follow and hold a set temperature, so making this adjustment should be easy.